Model adequacy testing using posterior prediction (Data Version). This tutorial presents the general principles of assessing the reliability of a phylogenetic inference through the use of posterior predictive simulation (PPS). PPS works by assessing the fit of an evolutionary model to a given dataset, and analyzing several test statistics using a traditional goodness-of-fit framework to help explain where a model may be the most inadequate. Assessing the fit of an evolutionary model to the data is critical as using a model with poor fit can lead to spurious conclusions. However, a critical evaluation of absolute model fit is rare in evolutionary studies. Posterior prediction is a Bayesian approach to assess the fit of a model to a given dataset (Bollback 2002; Brown 2014; Höhna et al. 2018), that relies on the use of the posterior and the posterior predictive distributions. The posterior distribution is the standard output from Bayeisan phylogenetic inference. The posterior predictive distribution represents a range of possible outcomes given the assumptions of the model. The most common method to generate these possible outcomes, is to sample parameters from the posterior distribution, and use them to simulate new replicate datasets (). If these simulated datasets differ from the empirical dataset in a meaningful way, the model is failing to capture some salient feature of the evolutionary process. A schematic presentation of data- versus inference-based approaches to assessing model plausibility with posterior predictivesimulation. Most statistics proposed for testing model plausibility compare data-based characteristics of the original data set to the posterior predictive data sets (e.g., variation in GC-content across species). ‘RevBayes‘ additionally implements test statistics that compare the inferences resulting from different data sets (e.g., the distribution of posterior probability across topologies). Multiple sequence alignments (MSAs) are represented as shaded matrices and arrows originating from MSAs point to the MCMC samples of tree topologies and scalar model parameters ($\theta$) resulting from Bayesian analysis of that MSA. Subscripts of MCMC samples taken during analysis of the original data index the samples $(1, …, n)$. 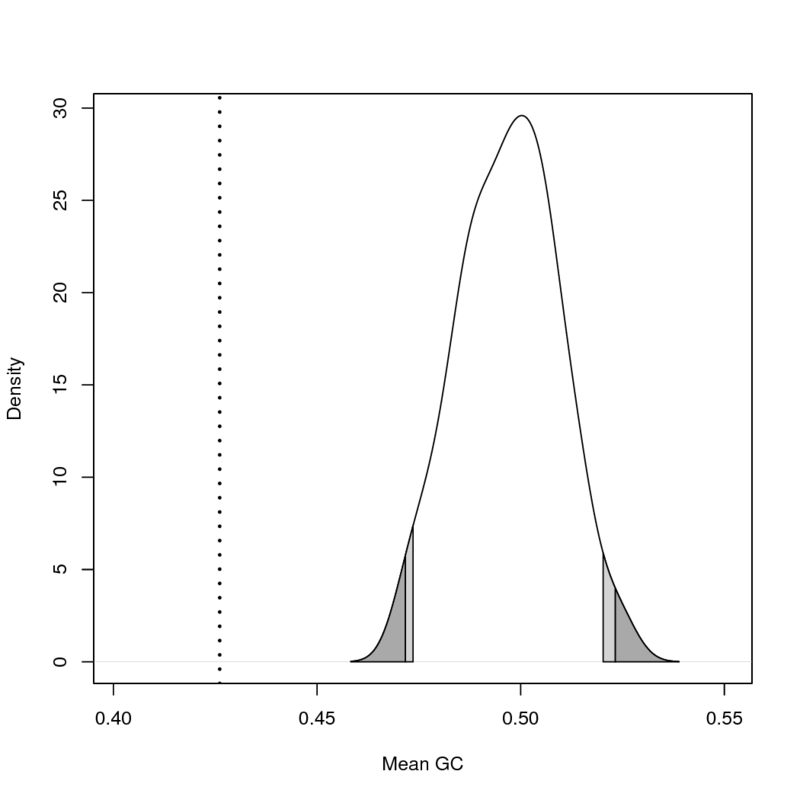 Subscripts for each posterior predictive data set indicate which MCMC sample was used in its simulation. Subscripts for MCMC samples resulting from analysis of a posterior predictive data set first indicate the posterior predictive data set that was analyzed and next index the MCMC samples from analysis of that particular data set $(1, …, m)$. The framework to construct posterior predictive distributions, and compare them to the posterior distribution is conveniently built in to ‘RevBayes‘ (Höhna et al. 2014; Höhna et al. 2016; Höhna et al. 2018). In this tutorial we will walk you through using this functionality to perform a complete posterior predictive simulation on an example dataset. Most statistics proposed for testing model plausibility compare data-based characteristics of the original data set to the posterior predictive data sets (e.g., variation in GC-content across species). In data-based assessments of model fit one compares the empirical data to data simulated from samples of the posterior distribution. ‘RevBayes‘ additionally implements test statistics that compare the inferences resulting from different data sets (e.g., the distribution of posterior probability across topologies). These are called inference-based assessments of model fit. For these assessments one must run an MCMC analysis on each simulated data set, and then compare the inferences made from the simulated data to the inference made from the empirical data. In this tutorial we will only cover the data-based method of assessing model plausibility. The inference-based method can be a powerful tool that you may want to explore at another time. the entire data-based posterior prediction process would run on the example dataset. However, in this tutorial, we will walk through each step of this process on an example dataset to explain what is happening in detail. To begin, we first need to generate a posterior distribution from which to sample for simulation. This is the normal, and often only, step conducted in phylogenetic studies. Here we will specify our dataset, evolutionary model, and run a traditional MCMC analysis. This code is all in the data_pp_analysis_JC.Rev file. First, let’s set up some workspace variables we’ll need. We’ll specify a general name to apply to your analysis. This will be used for future output files, so make sure it’s something clear and easy to understand. Now specify and read in the input file. This is your sequence alignment in NEXUS format. If we open the pps_JC_Model.Rev script, most of this script should look familiar from the Substitution Models. Nevertheless, we will look at some parts of script for a very brief repitition. Here we are specifying that we should use the Jukes-Cantor model, and have it applied uniformly to all sites in the dataset. While this obviously is not likely to be a good fitting model for most datasets, we are using it for simplicity of illustrating the process. This sets a uniform prior on the tree topology. This sets an exponential distribution as the branch length prior. This builds the tree by combining the topology with branch length support values. Now let’s run MCMC on our empirical dataset, just like a normal phylogenetic analysis. Here we use the Jukes-Cantor substition model. After specifying a model, we will conduct the MCMC analysis with the script pps_MCMC_Simulation.Rev. Much of that script should look familiar from the Substitution Models, but let’s take a look at the script and break down and revisit some of the major pieces as a refresher. Much of this will be a familiar to you from the Substitution Models. First we need to specify some monitors. Here the monitors are just being advanced by the value of mni which is being incremented each generation. Next, we will call the MCMC function, passing it the model, monitors and moves we specified above to set to build our mymcmc object. Specify a burnin for this run. Finally, we will execute the run for a specified number of generations. The number of generations and printed generations is important to consider here for a variety of reasons, in particular for posterior predictive simulation. When we simulate datasets in the next step, we can only simulate 1 dataset per sample in our posterior. So, while the number of posterior samples will almost always be larger than the number of datasets we will want to simulate, it’s something to keep in mind. Now let’s actually run the MCMC in ‘RevBayes‘. After the process completes, the results can be found in the output_JC folder. You should see a number of familiar looking files, all with the name we provided under the analysis_name variable, pps_example in this case. Since we set the number of runs (nruns=2) in our MCMC, there will be two files of each type (.log .trees .var) with an _N where N is the run number. You will also see 3 files without any number in their name. These are the combined files of the output. These will be the files we use for the rest of the process. If you open up one of the combined .var file, you should see that there are 1000 samples. This was produced by our number of generations (10,000) divided by our number of printed generations (10), which we specified earlier. This is important to note, as we will need to thin these samples appropriately in the next step to get the proper number of simulated datasets. The next step of posterior predictive simulation is to simulate new datasets by drawing samples and parameters from the posterior distribution generated from the empirical MCMC anlaysis. Let’s take a look at each of the calls in the pps_Simulation.Rev script so that we can understand what is occurring. First, we read in the trace file of the Posterior Distribution of Variables. Now we call the posteriorPredictiveSimulation() function, which accepts any valid model of sequence evolution, and output directory, and a trace. For each line in the trace, it will simulate a new dataset under the specified model. Now we run the posterior predictive simulation, generating a new dataset for each line in the trace file that was read in. This is the part where we need to decide how many simulated datasets we want to generate. If we just use the pps.run() command, one dataset will be generated for each sample in our posterior distribution. In this case, since we are reading in the combined posterior trace file with 2000 samples, it would generate 2000 simulated datasets. If you want to generate fewer, say 1000 datasets, you need to use the thinning argument as above. In this case, we are thinning the output by 2, that is we are dividing our number of samples by 2. So that in our example case, we will end up simulating 1000 new datasets. This process should finish in just a minute or two. If you look in the output_JC folder, there should be another folder called pps_example_post_sims. This folder is where the simulated datasets are saved. If you open it up, you should see 100 folders named posterior_predictive_sim_N. Where N is the number of the simulated dataset. In each of these folders, you should find a seq.nex file. If you open one of those files, you’ll see it’s just a basic NEXUS file. These will be the datasets we analyze in the next step. We will look at the major concepts of the pps_DataSummary.Rev to better understand how it works. For a more complete discussion of the statistics involved, please review (Höhna et al. 2018). In general, this script and these statistics work by calculating the statistics of interest across each posterior distribution from the simulated datasets, and comparing those values to the values from the empirical posterior distribution. These same statistics are calculated for both the posterior distributions from the simulated datasets and the posterior distribution from the empirical dataset. emp_pps_file = "results_" + model_name + "/empirical_data_" + analysis_name + ".tsv"
sim_pps_file = "results_" + model_name + "/simulated_data_" + analysis_name + ".tsv"
outfileName = "results_" + model_name + "/data_pvalues_effectsizes_" + analysis_name + ".tsv"
For more a more detailed description please look at (Höhna et al. 2018). Let’s take a look at the pps_PValues.Rev script to get a better idea of what is happening. these snippets calculate the various p-values of interest to serve as our goodness-of-fit test. Another way that you can calculate the magnitude of the discrepancy between the empirical and PP datasets is by calculating the effect size of each test statistic. Effect sizes are useful in quantifying the magnitude of the difference between the empirical value and the distribution of posterior predictive values. The test statistic effect size can be calculated by taking the absolute value of the difference between the median posterior predictive value and the empirical value divided by the standard deviation of the posterior predictive distribution (missing reference). Effect sizes are calculated automatically for the inference based test statistics in the P analysis. The effect sizes for each test statistics are stored in the same output file as the P-values. calculates the effect size of a given test statistic. Once execution of the script is complete, you should see a new directory, names results_JC. In this folder there should be 3 files. Each of these is a simple tab-delimited (TSV) file containing the test statistic calculation output. If you have these 3 files, and there are results in them, you can go ahead and quit ‘RevBayes‘. The distribution of mean GC values calculated from the simulated data set is shown. The dotted line represents the mean GC calculated from the empirical data set.The Jukes-Cantor model does not adequately describe the empirical data. This plot was generated in Rusing the scripts/plot_results.R script. You can get an estimate of how the model performed by examining the P-values in the data_pvalues_effectsizes_pps_example.csv file. In this example, a quick view shows us that most of the statistics show a value less than 0.05. This leads to a rejection of the model, suggesting that the model employed is not a good fit for the data. This is the result we expected given we chose a very simplistic model (JC) that would likely be a poor fit for our data. However, it’s a good example of the sensitivity of this method, showing how relatively short runtimes and a low number of generations will still detect poor fit. You can also use Rto plot the results. Run the Rscript scripts/plot_results.R. This will generate a pdf plot for every test statistic. Included in the scripts folder is a second model script called pps_GTR_Model.Rev. As a personal exercise and a good test case, take some time now, and run the same analysis, substituting the pps_GTR_Model.Rev model script for the pps_JC_Model.Rev script we used in the earlier example. You should get different results, this is an excellent chance to explore the results and think about what they suggest about the fit of the specified model to the dataset. Do you find the goodness-of-fit results to suggest that the GTR or JC model is a better fit for our data? Which test statistics seem to show the strongest effect from the use of a poorly fitting model? In this tutorial you have learned how to use ‘RevBayes‘ to assess the fit of a substitution model to a given sequence alignment. As you have discovered, the observed data should be plausible under the posterior predictive simulation if the model is reasonable. In phylogenetic analyses we choose a model, which explicitly assumes that it provides an reasonable explanation of the evolutionary process that generated our data. However, just because a model may be the ’best’ model available, does not mean it is an appropriate model for the data. This distinction becomes both more critical and less obvious in modern analyses, where the number of genes often number in the thousands. Posterior predictive simulation in ‘RevBayes‘, allows you to easily check model fit for a large number of genes by using global summaries to check the posterior predictive distributions with a comfortable goodness-of-fit style framework. The process described above is for a single gene or alignment. However, batch processing a large number of genes with this method is a relatively straight forward process. ‘RevBayes‘ has built in support for MPI so running ‘RevBayes‘ on more than a single processor, or on a cluster is as easy as calling it with openmpi. would run the entire posterior predictive simulation analysis on a single dataset using 16 processors instead of a single processor. Use of the MPI version of ‘RevBayes‘ will speed up the process dramatically. This should loop through all of the data files in the list provided, and run the full posterior predictive simulation analysis on each file. Using a method like this, and combining it with the MPI call above, you can scale this process up to multiple genes and spread the computational time across several cores to speed it up. Bollback J.P. 2002. Bayesian model adequacy and choice in phylogenetics. Molecular Biology and Evolution. 19:1171–1180. Brown J.M. 2014. Predictive approaches to assessing the fit of evolutionary models. Systematic Biology. 63:289–292. Höhna S., Coghill L.M., Mount G.G., Thomson R.C., Brown J.M. 2018. 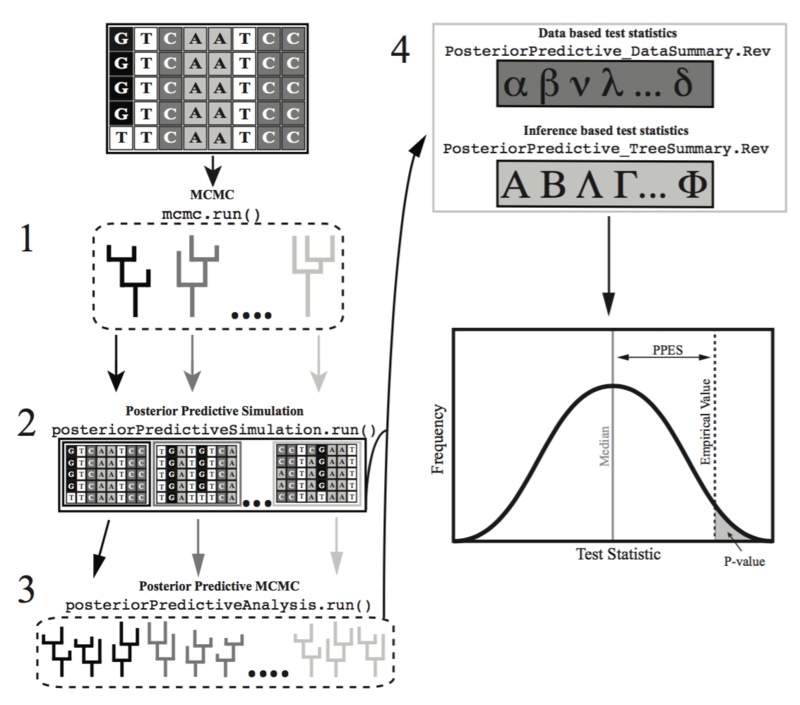 P^3: Phylogenetic Posterior Prediction in RevBayes. Molecular biology and evolution. 35:1028–1034.